To illustrate: Consider a manufacturer and distributor of lawn-and-garden products, such as topsoil, potting soil, and ground cover. Its customers are lawn-and-garden retailers, hardware stores, and mass merchants. The company’s operating cycle starts when customers place orders in the fall — nine months ahead of its peak selling season. So, the business begins amassing product in the fall, but curtails operations in the winter. In late February, product accumulation continues, with most shipments going out in April. At this point, a lot of cash has flowed out of the company to pay operating expenses, such as utilities, salaries, raw materials costs, and shipping expenses. But cash doesn’t start flowing into the company until customers pay their bills around June. Then, the company counts inventory, pays remaining expenses, and starts preparing for the next year. It’s strategic selling window — which will determine whether the business succeeds or fails — lasts a mere eight weeks. More important, draft a formal business plan that includes financial projections for next year. Some companies even project financial results for three to five years into the future. Seasonal business owners can’t rely on gut instinct. 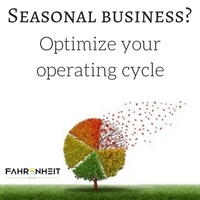 You need to develop budgets, systems, processes, and procedures ahead of the peak season to effectively manage your operating cycle. Seasonal businesses face many distinctive challenges, but our professionals can help. Contact us. We’re ready to help you overcome these obstacles and strengthen your bottom line.